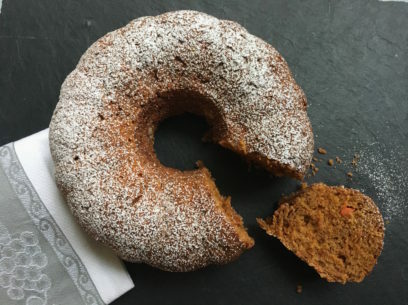 Like to know the secret to this simple carrot cake’s divineness? 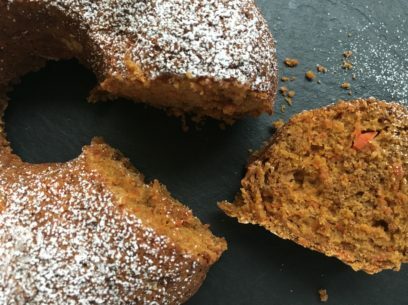 Traditional Greek carrot cakes do not use raw, grated carrots and instead go a wonderfully different way. The carrots are first boiled in just a bit of orange juice and water with a few whole cloves and a cinnamon stick. Right there you know this recipe is going in an amazing direction! The moist, dense and light crumb is perfection in every bite. moist, light, dense crumb – perfection! The carrots are boiled until just fork tender and the cooking liquid is used as well so you get all that carrot goodness. 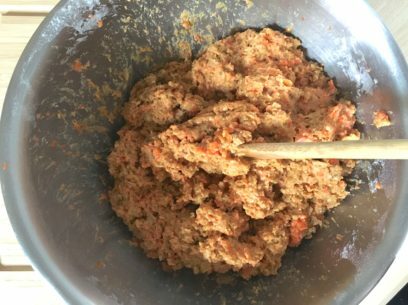 No more than a total of 5 or 6 quick pulses in the food processor, adding a splash of cooking liquid, render the carrots a fine, moist grate – not mushy or pureed and not hard or crumbly. 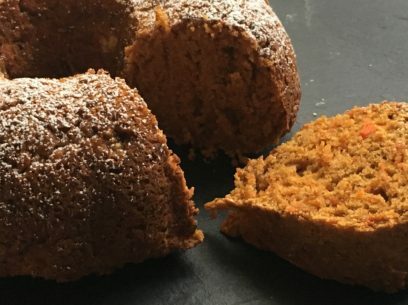 The authentic Greek additions of molasses, orange or lemon zest and a pinch of coriander round out the cake flavors perfectly for a mighty nice breakfast – my favorite time to serve Greek carrot cake. A quick note about the cooking liquid – DON’T THROW IT OUT. And to get the ideal amount of cooking liquid leftover, bring the pot of chopped carrots up to a good boil first, then lower to the lightest simmer and cook, uncovered, for 20 minutes. This should leave you with just about 1 cup or so of cooking liquid which is just, or a smidgen more, than what you’ll need for the recipe. If you are left with less cooking liquid, simply add orange juice or water to make up the difference. The batter will be VERY thick – and very yummy! – so make sure to spread it evenly in your pan. Chop carrots into smallish pieces and add to a smaller rather than larger pot with orange juice, water, cinnamon stick and cloves (contained). In medium sized bowl, combine flour, baking powder, baking soda and salt. Set aside. In large bowl, add 1/2 cup cooking liquid, sugar and molasses. Whisk until combined. Add spices, whisk. Add oil, whisk. Add carrots and stir to combine completely. Add dry ingredients to wet and mix completely. Stir in golden raisins and/or nuts at this time if you’re including them. Want to use a 9×13″ cake pan? Just bake for about 40 to max 45 minutes. And dust with powdered sugar if you’d like! You’ll get 10 good sized breakfast pieces and up to 20 dessert slices from 1 bundt. What temperature are we baking the cake? My preschooler son will love these, as cakes/breads like this are the only way I can get vegetables into him these days! Thank you! Can we make it gluten free by substituting flour with ground almonds? I would say that almond flour would weigh the recipe down considerably and there would have to be other modifications made to accommodate for it. perhaps try using GF flour instead? Can drop cookies be made from the batter? Being Orthodox, I’d like to try this for our pot luck after Divine Liturgy. Oh I wonder! That might work actually, though that’s just a guess 🙂 Let me know if you try it, would love to share if it works! this looks amazing…I just ♥ carrot cake, and the golden raisins sound like a nice addition, thanks for sharing! Another winner . This cake is absolutely delicious and hearty as well. I can’t decide which is more awesome – this or the apricot cake !! Καλή Σαρακοστή !! Και καλή όρεξη !! In this paragraph “Drain carrots and RESERVE COOKING LIQUID!!!! 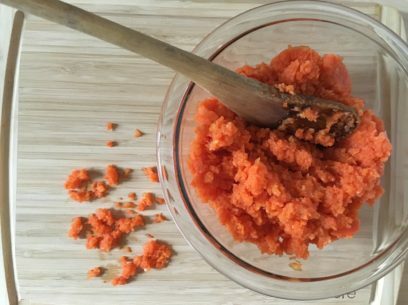 Add carrots to food processor, pulse 2 or 3 times, scrape down sides, add 1/3 cooking liquid and pulse 2 more times. Scrape down side and set aside.” did you mean “add 1/3 CUP cooking liquid”? Can you use pure maple syrup instead of molasses? Can I use spelt flour? I;ve never worked with spelt flour to be honest. is there a spelt to all-purpose substitution ratio somewhere? Can I replace the molasses with maple syrup? Also, Can I use Bob Mill gluten free 1for1 flour? When you strain the carrots, do you leave the cloves in or take them out? That is, are the cloves just for seasoning the carrots while boiling or are they also grated into the cake? Thank you for your recipe. Thank you! I made this for a work event last week. Some of my colleagues are orthodox and fast on Fridays. Even the non-vegans really liked it!! Can I substitute applesauce for the oil? This cake looks amazing! Is the molasses the liquid type you get or is it molasses sugar form ? This is my absolute favorite cake! I subbed applesauce and it works beautifully. These convert beautifully into a whole wheat muffin! I’m freezing a batch for Holy Week! Thank you, you’ve saved my priest-husband from a week of Larabars! Thank you for this recipe! An absolute hit over the Easter Lent period for my family. It froze very very well!